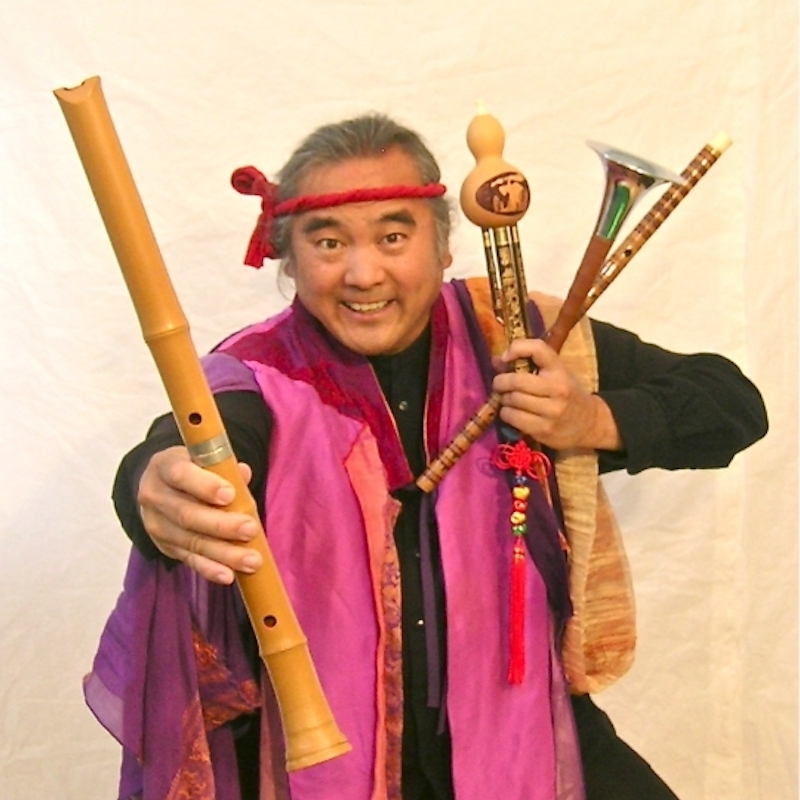 I specialize in Asian instruments both wind and percussion, as well as the storytelling of traditional pan Asian folktales and myths. The wind instruments I play, mostly flutes, are typically made of bamboo: Shakuhachi (Japan), Ditze (China), Kubing (Filipino jaw harp) as well as a variety of instruments from Thailand, Indonesia, and Siberia. I am most skilled and have knowledge of traditional Filipino gong music from the southern island of Mindanao. Kulintang, an ensemble music of bronze gongs and drumming, was the music I studied in the late 1970’s under the tutelage of master musicians teaching at the University of Washington. Later I studied with master artists in both Hawaii and while in residence in the Philippines. Upon my return I pioneered the study and performance of this music and created the first music groups in California. By the mid-80s I refocused my performance and creative work with storytelling. Along with my wife and creative partner Nancy Wang, we formed Eth-Noh-Tec, storytelling theater company that was a fusion of music, movement, and narrative. Inspired by the time held tradition of storytelling found around the world, we focus on both Pan-Asian and Asian American stories. The body of work found in both folktales and mythology are rich with metaphors that although maybe thousands of years old, have much to say about modern life. We also have created a body of work that address is contemporary Asian American themes: immigration, racism, cultural heritage and identity. Eth-Noh-Tec was officially created in 1982, through the creative and matrimonial union of myself and Nancy Wang. We were introduced to each other through the Asian American theater. What is your teaching philosophy and how do you use that to approach each new audience/classroom? Here are some of the principles that I keep in mind when teaching or performing. All students are excited about learning about other cultures when given a chance to participate. Learning about other art forms and cultures of the world opens imagination for young minds, especially when presented with joy, inclusivity, and relevancy to their daily lives. As with any good education or teaching techniques, it’s not about what the teacher or artist knows... it’s shifting the focus on the students and the audience, gauging their reaction, being able to shift energy, performance dynamics, and new information so that the listener is always in discovery mode. Discovery is what our art education is all about. My programs in music, dance, theater and storytelling integrates all the elements of language arts, geography and social studies, so the education becomes a fun experience. Performing these traditional stories and music also celebrates the need for diverse cultures in America. It cultivates respect and understanding for all peoples. Also because of the inherent value found in storytelling, i.e. morals, self reflection, Heritage and cultural identity… it underscores that education moves beyond mere schoolwork and into touches cultural values and is socially relevant to our diverse communities. What made you decide to become a roster teaching artist with Young Audiences? I was going through a big crisis with career as a performing artist. For years I had started and trained the first traditional Filipino Kulintang group in SF Bay Area. There was power grabbing amongst the members- which resulted in a betrayal and my naïve self lost out. “What was I to do with all this traditional music knowledge?”. Young Audiences came along at the right time when I could take my traditional performance knowledge of this music and dance and introduce it to school children. That was the beginning of “Kids Love Kulintang”, a now 33-year-old arts education program ! eventually it evolve to pan Asian Storytelling in the show called “ Asia FantAsia”. Young Audiences made this all possible!